Freshly Handmade: A Quilt For My Son: Finished! A Quilt For My Son: Finished! It might have taken me 8+ months to finish, but I'm pretty sure my son thinks it was worth the wait. Finally, he too gets to snuggle under his very own quilt. 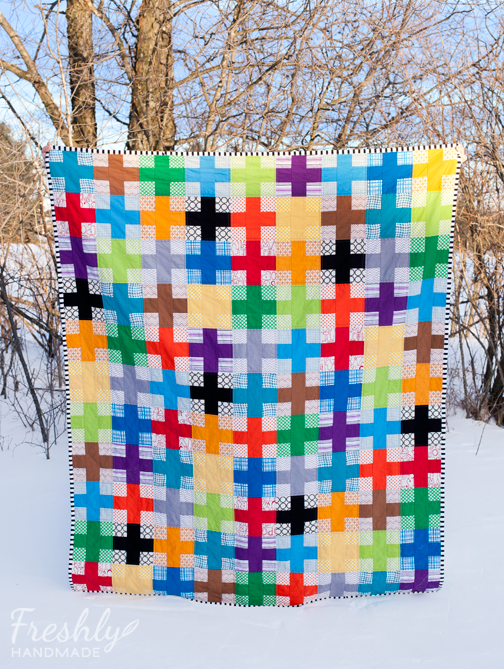 This quilt started out a little sketchy, in my opinion, when I let my son pick out whatever solid colors he wanted. Needless to say, I was horrified at the color combination he chose and had to jump in and rectify the situation. You can read all about it in my first post here. I have to say, it all worked out splendidly. 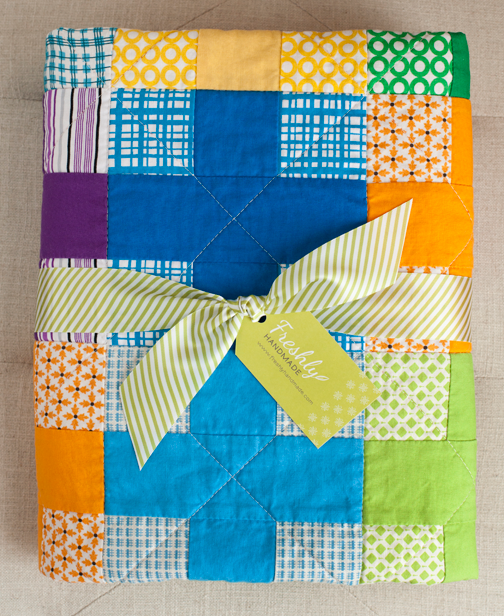 I'm not usually one for super bright colors, but I really love this quilt, especially for my son. He loves life and is genuinely a happy kid. Happy is how I would describe this quilt as well. 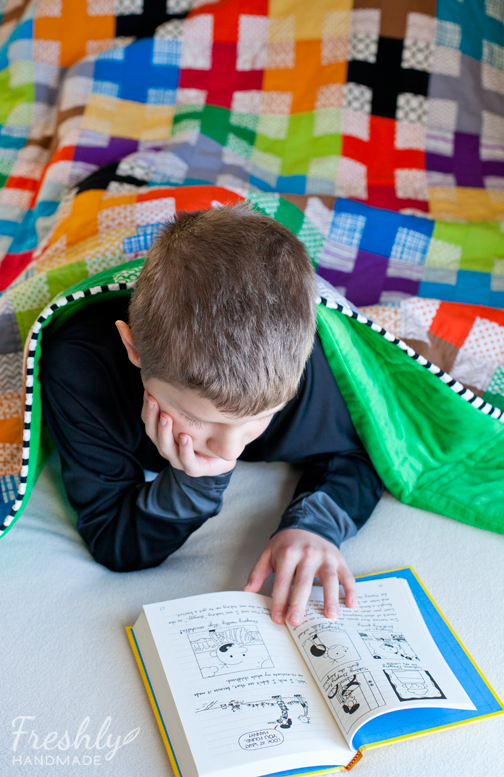 I backed his quilt with super soft green minky and used a black and white stripe binding fabric, which I think works perfectly. I racked my brain on how I wanted to quilt it, but ultimately decided less is more for this one. I straight stitched on both sides of the vertical and horizontal seams using a charcoal colored thread. I debated on that too, but thought the gray with blend well with all the colors and look a little more masculine. I ended up making the quilt a little less wide than I had originally planned, so I had left over blocks to make a baby quilt. I stitched this one a little bit differently using off white thread. I also stitched diagonally through the blocks and stitched in the ditched horizontally and vertically. I love how that turned out. I wanted to make this one unisex, so I decided to back it with red minky instead of green. This quilt is available for purchase in my newly opened Etsy store and would make a wonderful baby gift. Below is the link to the listing. 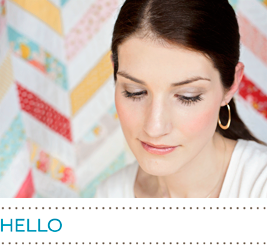 I am going to be working on a softer, more feminine version of this quilt and plan to offer a pattern as well. Your Son looks like he is very happy with it!! Beautiful and congrats on your Etsy shop!! Some of your fabrics match the color of the sky, how did you plan that? 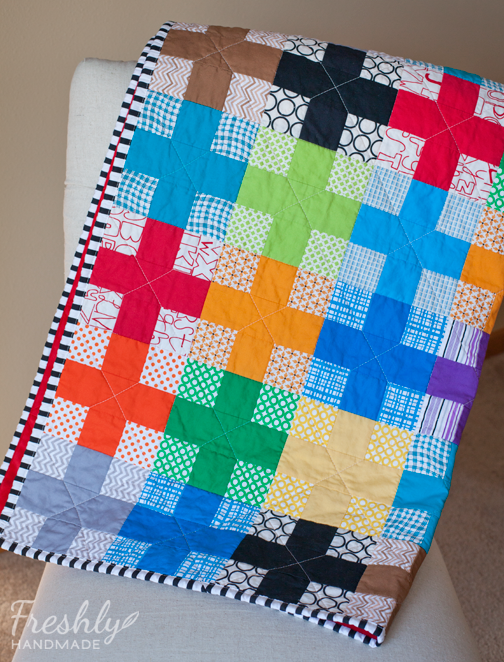 Love how your son's quilt turned out! And a baby quilt out of the leftovers?!! Awesome! Congrats on your Etsy shop! That is sooo cool! I love the way you used the solid cross on the print background for each block - really snazzy (as we say here in NZ!) Great work! it is fantastic. My son is like that too - happy and full of life, and I still need to make him a quilt. Think I am going to go colour all the way! Another beautiful quilt Stacy! 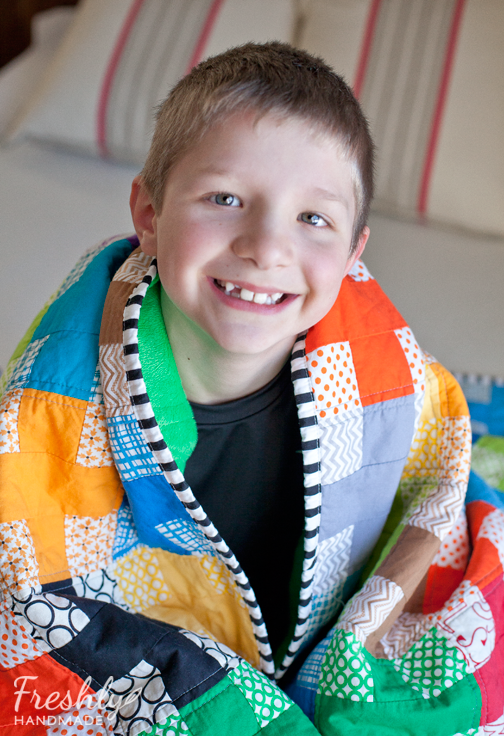 :) I'm sure your son is going to love his quilt for years to come! 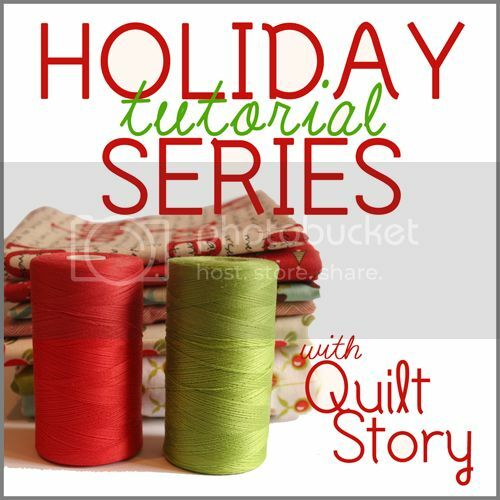 Would love for you to stop by and link this up to Fabric Frenzy Friday! Wow. This is so fun and so bright. How funny! I finshed a cross quilt too. Mine is simpler... Love the colours on this one, they do scream happy. Congrats! Just stunning! The fabric colours, the layout, love! Love how you matched the solids to the prints for each color. It's really beautiful! 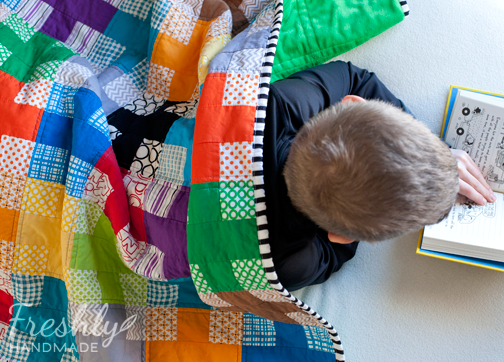 This quilt is so much fun, and it's no wonder that your son loves it. The black and white stripe binding was the perfect choice, too! SO fabulous! He looks very pleased. Love the photo in the snow and that binding!